I just love it when someone thinks outside the box. Today, thinking outside the box when it comes to wall coverings may be to consider wallpaper! BUT, if you just can’t stand the thought (and for those who “walltexed” through the ‘70’s will know what I mean) then there are some great alternatives for fabulous and fun wall covering designs. 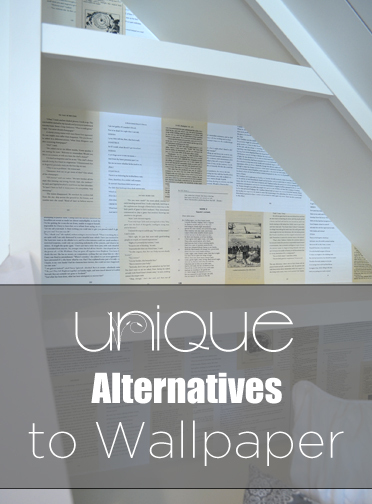 Here are a few~~Pages torn from an old classic book; overlayed and pasted on walls AND/OR CEILINGS with your basic wallpaper paste. Yes, they still sell it! I know this isn’t a new idea, but it’s worth a re-visit if you want some warmth on the cheap! Depending on the room use dictionary pages (office), children’s fairy tales (child’s room), text books (computer space in college student’s room), old cookbooks (kitchen), etc. And if you can’t part with any of your treasured books, thrift stores are the place to go! I bought some children’s books just this past weekend to use the jackets to decorate a play nook for my grandkids! Attach large swatches of fabric to a wall using nothing more than spray starch and a credit card (used for the plastic, not the credit) That’s right! It works great and comes off easily with some warm water when you’re ready for a change. Have you seen corrugated tin below a chair rail? It looks great in a family room, kid’s room, or used as the façade for a snack bar. This design element can really look cool! My daughter did a picket fence part way up a wall in her daughter’s room with the sweetest garden flower decals behind it. It looked darling! Don’t forget the tried and true board and batten and of course…..
Also, a piece of chair rail molding, then paint a section, then add another strip of a different molding and voila!…..you’ve got an entire accent wall that looks terrific. Let’s talk about the wallpaper again……consider using several strips of different styles of wallpaper to design a very fun craft room.